I'm a big fan of labradorite. I've always been drawn to that subtle shimmer in what for all rights looks like it should be a dull stone. To me, labradorite is never dull but holds a beauty and depth that isn't in-your-face but more subtle and elegant than most gemstones. When I saw BeadsInTheBelfry's avatar on the Etsy Forums, I was immediately struck with the beauty of the piece in their avatar and followed the link to the shop, forgetting all about the thread I was posting in. The piece was just that eye-catching that it drew my attention and banished everything else from my mind. 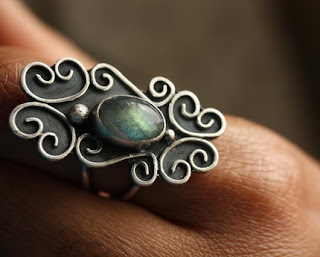 This Labradorite Filigree Scroll Ring is that breathtaking piece. Nina Jackson created each individual piece of scroll work by hand and soldered them together. She then soldered them to a sterling silver sheet to create a closed filigree form. The labradorite itself is bezel cut and shines with shades of green and blue. She even cut out a peep hole at the back to allow more light into the stone. I've fallen in love with this piece and there's more beautiful, quality work to browse through in her shop with plenty of excellently taken photographs to show everything off. Go take a look and see! 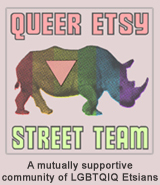 TO VISIT BEADSINTHEBELFRY'S SHOP YOU CAN CLICK THE PICTURE ABOVE OR, IF YOU RATHER, CLICK RIGHT HERE! I LOVE this ring! BEAUTIFUL!